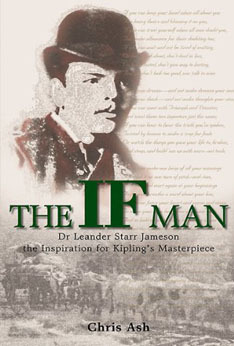 A rollicking biography of Dr Leander Starr Jameson; hero, rogue and rascal of Empire and the man who inspired Kipling to write his masterpiece, If The famous poem, If by Rudyard Kipling, is said to be based on the life of Jameson, and the suffering he endured as a result of the 1896 raid that he and his Rhodesian and Bechuanaland policemen carried out on Paul Kruger s Transvaal Republic. In this engaging biography in the style of Wilbur Smith-meets-Louis l Amour, Ash recounts the life of this colonial statesman known as Dr Jim or simply The Doctor . He was an enigmatic man. When he died The Times estimated that his astonishing personal sway over his followers was equalled only by that of Parnell, the Irish patriot. Although probably most known for his role in The Jameson Raid , Jameson still had a successful political life. He died on 26 November 1917 in London. His body was laid in a vault at Kensal Green Cemetery where it remained until the end of the First World War. Ian Colvin (1923) writes that Jameson s body was then … carried to Rhodesia and on 22 May 1920, laid in a grave cut in the granite on the top of the mountain which Rhodes had called The View of the World , close beside the grave of his friend. Dr Jameson was a very remarkable man – an unashamed creator and risk-taker who understood the true meaning of loyalty – and in Chris Ash he has found his ideal biographer. Andrew Roberts, bestselling author of The History of the English-speaking Peoples and The Storm of War. The book is much more than a biography – there is extensive history of southern Africa to be gleaned here… In all, Jameson’s life was so extraordinary it could read like a Wilbur Smith novel, which is no bad thing. It may be hard to view Jameson as a hero in these politically correct times, but Chris has done a great job in making his work an entertaining read and I heartily recommend it. Geoffrey Hay, The Shetland Times.